At this time other Soviet design bureaus emerged as competitors to Korolev in the production of space launchers and spacecraft (Yangel, Chelomei). Their collective ambitious plans – for manned expeditions to the moon and Mars, for space battle stations and combat spacecraft in earth orbit, for a huge array of launch vehicles and satellites – were authorized on a study basis in 1960. At the beginning of the 1960’s an unwieldy total of thirty space systems were in development. But the military soon asserted control to the situation and only a fraction of these projects reached the hardware stage. Unlike the American Space program which had NASA as a single coordinating structure, throughout most of the 1960s, the USSR’s program was split between several competing design groups led by Sergei Korolev, Mikhail Yangel, Valentin Glushko and Vladimir Chelomei. 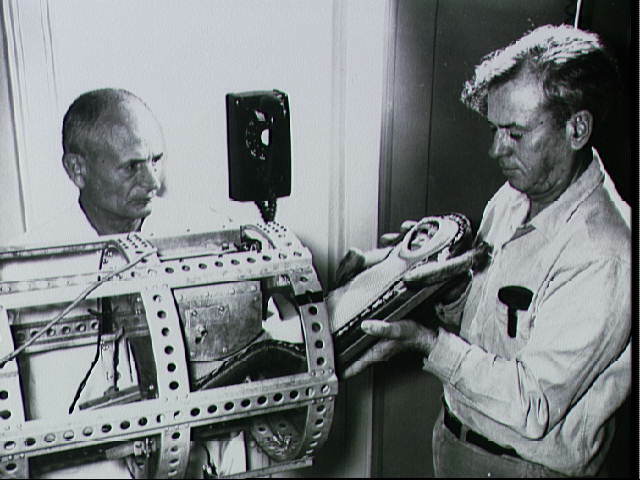 January 21: Little Joe 1B-Mercury launch escape system test flight with Miss Sam, a rhesus monkey who survived. 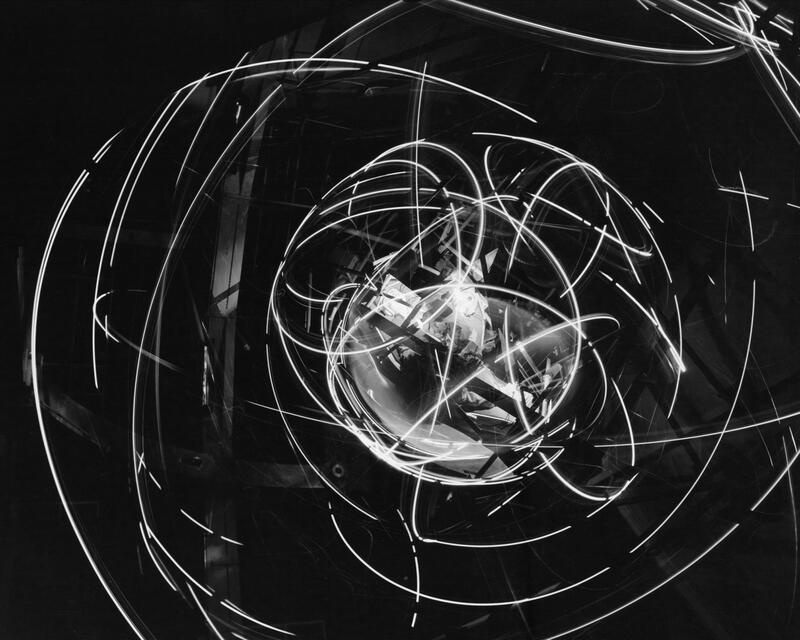 During the mission, all sequences operated as planned; the spacecraft attained a peak altitude of 9.3 statute miles, a range of 11.7 statute miles, and a maximum speed of 2,021.6 miles per hour. 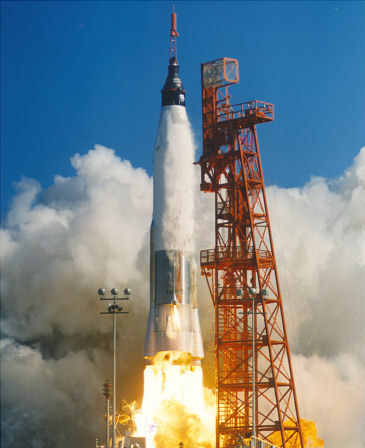 Atlas launch vehicles for Project Mercury was listed as 15, and the total purchase of Mercury spacecraft was listed as 26. 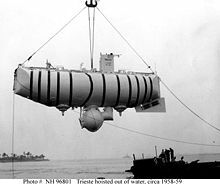 January 23: The Trieste, a submersible designed by Auguste Piccard, reaches the bottom of the Mariana Trench (35,814 ft) with Jacques Piccard and USN Lt. Don Walsh (this record for the deepest dive still stands). February 4: Failed launch of Discoverer 9 from Vandenburg AFB on a Thor-Agena A.
February 19: Failed launch of Discoverer 10 from Vandenburg AFB on a Thor-Agena A.
February 26: Midas I (early warning satellite) launch failure on a Atlas-Agena A from LC14. First Atlas -Agena launch. February: Group 1 astronaut training: Held at UNC Morehead Planetarium, Chapel Hill, North Carolina, star recognition, approximately 28 hours per astronaut. The purpose of this training was to assist the astronaut in correcting spacecraft yaw drifts. February: Group 1 astronaut training: Egress training, phase 1. The first egress training program was conducted in February 1960, in which the egress trainer, spacecraft no. 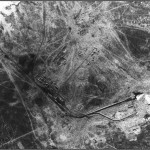 5, and the NASA Langley Research Center Hydrodynamic Basin no. 1 were used. Each of the astronauts made several egresses through the top hatch with and without the pressure suits in calm water and in artificially generated waves up to 2 feet in height. February: Group 1 astronaut training: Astronauts received about 5 hours of training “flight” time each on MASTIF (Multi-Axis Space Training Inertial Facility), Lewis Research Center in Cleveland, Ohio. After 30 rpm in all three axes, 30 minutes rest on a cot thoughtfully provided by technicians was required to regain stability. Multi-Axis Spin-Test Inertia Facility Trainer. 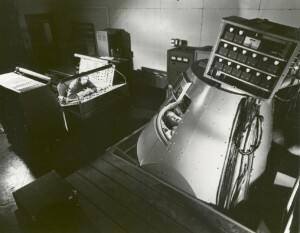 The Multi-Axis Spin-Test Inertia Facility (MASTIF) trainer, created in February 1960 by personnel of the NASA Lewis Research Center, was utilized for a simulation training program of recovery from tumbling flight in February 1960. The trainer consisted of a couch mounted inside three gimbals a three- axis hand controller, and a rate display. 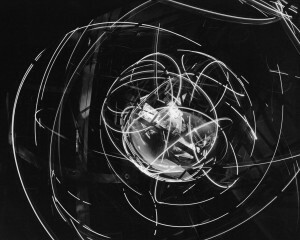 The astronauts were spun at rotational rates of about 30 rpm about all three spacecraft axes simultaneously. At a prearranged time, the astronauts assumed control of a three-axis compressed nitrogen fly-by-wire attitude control system and brought the couch to rest by reference to a Mercury rate-indicator instrument. The purpose of the trainer was to provide the best technique and improved confidence level for stopping inadvertent tumbling of the Mercury spacecraft. The training was considered valuable even though the possibility of its application was thought to be fairly remote. Initial planning called for placing the actual spacecraft on the Lewis MASTIF device for training in controlling attitude during retrofire. The MASTIF device was inside a full-scale wind tunnel, which could have been depressurized. Analysis also showed that it would be very difficult to reproduce the conditions of motion typical of space flight because of the very high inertia of the MASTIF gimbals. March 1: Dr. Carl T. Randt was named the first NASA Director of Life Sciences. March 7: An indoctrination program in free-floating during weightless flight was conducted for the astronauts at the Wright Air Development Center. The rear end of a C-131B aircraft was cleared and padded. Some 90 parabolas of 12 to 15 seconds of weightlessness each were flown. The objective was to present orientation problems of floating in space with the eyes opened and closed. 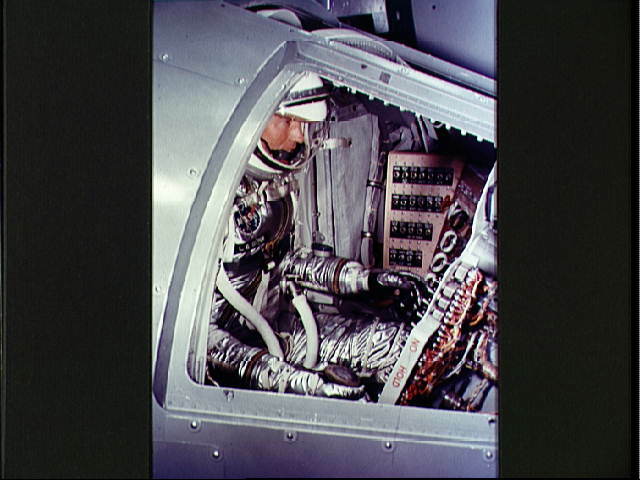 Also, the astronauts made attempts to use tools and move weights while they were in a weightless condition. March 7: The initial group of Soviet cosmonauts was chosen from Soviet Air Force jet pilots. Ivan Anikeyev, Pavel Belyayev, Valentin Bondarenko, Valery Bykovsky, Valentin Filatyev, Yuri Gagarin, Viktor Gorbatko, Anatoli Kartashov, Yevgeny Khrunov, Vladimir Komarov, Aleksei Leonov, Grigori Nelyubov, Andrian Nikolayev, Pavel Popovich, Mars Rafikov, Georgi Shonin, Gherman Titov, Valentin Varlamov, Boris Volynov, and Dmitri Zaikin. March 11: Pioneer V launched into a heliocentric orbit by a Thor-Able from LC17A. This was the first space probe specifically designed to study interplanetary space (between orbits of Earth and Venus), as well as to test long-range communications. The contact with the Pioneer-5 (P-2) spacecraft was lost on July 7 at the record-breaking distance of 36.2 million kilometers from Earth. 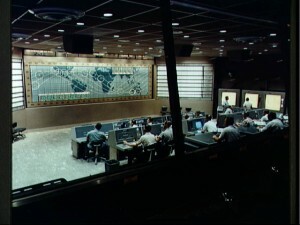 March 15: The Army Ballistic Missile Agency was transferred to NASA. This was agreed to in exchange of an agreement not to cancel the Saturn Project that was in competition with the Titan C. Development of the three-stage Saturn 1 had actually begun in December 1959. 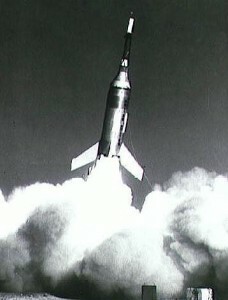 March 23: Failed attempted launch of an Explorer (S-46)/Juno II from LC26B. 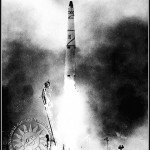 April 1: Launch of Tiros I, first weather satellite by a Thor-Able from LC17A. 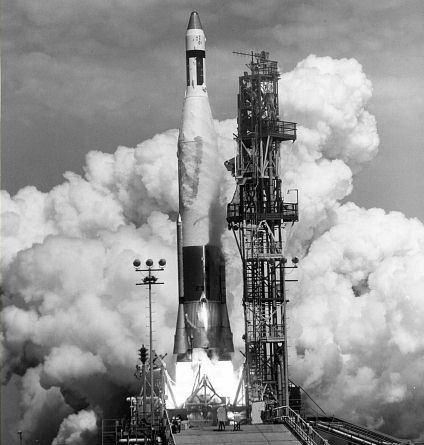 April 13: Transit 1B (Navy navigational satellite) was launched by a Thor-Able from LC17B. April 15: Discoverer 11 launched from Vandenburg AFB. April 15: Failed attempted launch of Luna (E-3, No. 1). April 16: Failed attempted launch of Luna (E-3, No. 2). March-April: Group 1 astronaut training: Egress training, phase 2, first full-scale open water egress program was conducted in the Gulf of Mexico near the Pensacola Naval Air Station in March and Apr. of 1960. This program consisted of 1 day at sea, during which both top and side hatch egresses were accomplished, and a second day at the training tank for water-survival technique and drill. The training was conducted in conditions of up to 10-foot swells, and no problems were experienced. The average egress time was about 4 minutes from a completely restrained condition in the spacecraft to being in the life raft. Survival training, phase 1. Water survival training was accomplished in conjunction with most of the water-egress programs and through briefings. The first water-survival training program was conducted at Pensacola, Florida, in March 1960. 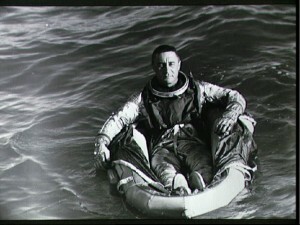 The training consisted of several briefings, a training film, and actual practice with the use of the survival equipment in the training tank and in the open sea during egress and recovery operations. May 1: Francis G. Powers is shot down over the Soviet Union in a U-2 high altitude overflight photographing launch sites at Baikonur. May 9: Space Medicine Branch Meeting in Miami Beach. Capt. Clifford P. Phoebus was elected President. May 10: The nuclear powered submarine USS Triton completes a submerged circumnavigation of the Earth in 83 days. May 12: It was announced that two Air Force Strategic Air Command flight crews had completed 15-day simulated space flights in a sealed cabin at Wright-Patterson Air Force Base, carrying out psychometrical tests at a flight console (unconfirmed). May 13: Failed attempted launch of Thor-Delta/ Echo satellite from LC17A. May 15: Launch of Sputnik 4 (also called Korabl Sputnik 1) an unmanned Vostok type capsule. Re-entry rockets failed. May 24: Successful launch of Midas II (early warning satellite) on an Atlas-Agena A from LC14. June 10: Two-week course for 30 physicians selected by the Department of Defense to be medical monitors at remote monitoring stations: first week at Patrick AFB, second at Manned Spacecraft Center, Langley AFB. Graduates to be designated “space surgeons.” They were briefed at Patrick AFB on the medical aspects of missile operations. The second week was spent at Space Task Group for a series of lectures and demonstrations on spacecraft systems, astronaut medical histories, and monitoring stations. This was followed by practice training sessions. 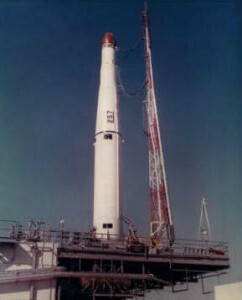 June 22: Launch of Thor-Able/Transit 2A from LC17B. June 29: Failed launch of Discoverer 12 from Vandenburg AFB on a Thor-Agena A.
June: Group 1 astronaut training: McDonnell AC, St. Louis, Mo., procedures trainer #2 (Systems management, attitude control, mission training), approximately 101 hours per astronaut. Mercury Procedures Trainers. The Mercury procedures trainer no. 1, housed in the NASA Full-Scale Tunnel at Langley Air Force Base, Va., and trainer no. 2, housed in the Mercury Control Center at Cape Canaveral, Fla., were the most valuable flight-crew trainers used in the Mercury Project. July 2: The House Committee on Science and Astronautics called for a revision of the National Space Program timetable so as to put a manned expedition on the Moon during this decade rather than after 1970, as provided for in the NASA 10-year program. July 20: A Polaris missile was launched for the first time from a submerged submarine. The George Washington was 30 miles off Cape Canaveral, and the missile flew to a pre-selected impact area 1,150 nautical miles down the Atlantic missile range. July 28: Two Russian dogs launched on a Korabl Sputnik flight died (Bars, Lisichka) when the booster exploded. This was basically a Vostok type of capsule. July 28: NASA announced a new manned spaceflight program. Called Apollo, its aim was to put three astronauts into sustained earth orbit, or into a flight around the moon. 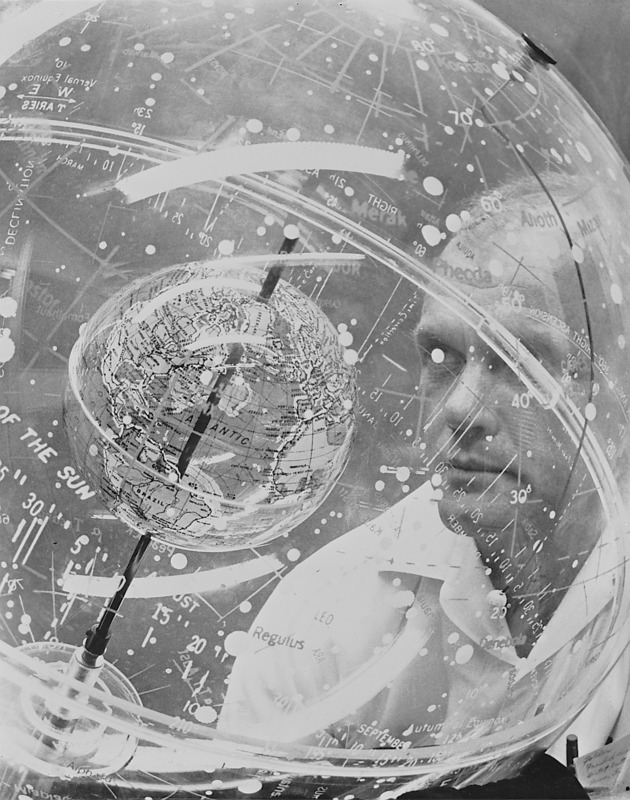 The program developed following planning by the Space Task Group in April and May of 1960. 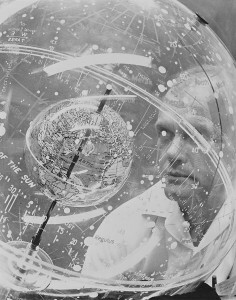 July 29: As the seven U.S. Project Mercury astronauts watched from a Cape Canaveral bunker, an Atlas D (Mercury Atlas-1) roared off into the rain-soaked skies carrying the first production model of the Mercury capsule on a planned suborbital flight. 58 seconds after the blastoff, the Atlas exploded and disintegrated after structural failure at the spacecraft-booster adapter. 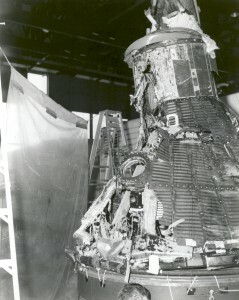 From the capsule itself came radio signals for 3½ minutes after the launching, indicating that only the Atlas booster had been destroyed, that the capsule had hit the sea intact. The damaged capsule was later recovered intact. 3 clays of remote-site training during which the astronauts applied the knowledge and techniques that they had learned during the briefings and demonstrations. August 10: Discoverer 13 launch. On 8/11, the first successful return of a payload from orbit and recovery of a capsule was accomplished. Payload was not recovered in mid-air, but picked up after an ocean landing. August 12: Launch of Echo I (passive communication satellite) by a Thor-Delta from LC 17A. August 16: USAF Capt. 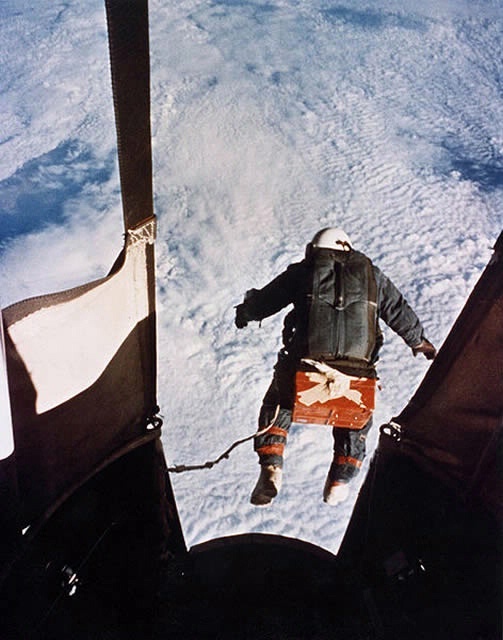 Joseph Kittinger parachutes from 102,800 ft from the Excelsior III balloon gondola as a part of Project Manhigh/Excelsior. He reaches a terminal velocity of 614 mph. Both records stood until the Red Bull Stratos jump by Felix Baumgartner on October 14, 2012 (altitude of 123,491 ft and velocity of 843.6 mph or each 1.25). Capt. Kittinger lost pressure in his right glove and suffered severe swelling of his hand due to ebullism). 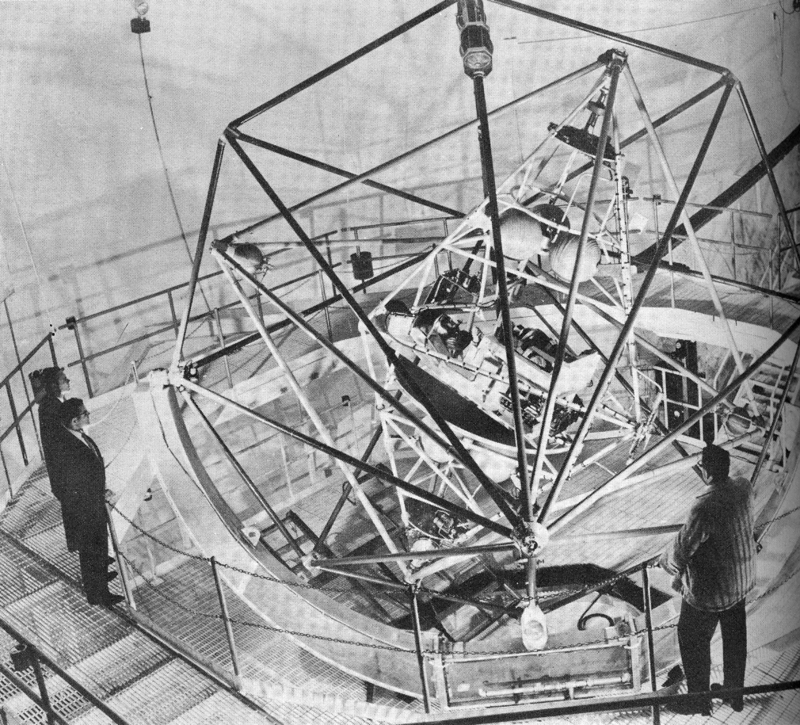 August 18: Launch of Discoverer 14, first successful Corona spy satellite. 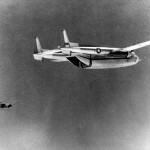 On 8/20/60 the first successful return by mid air capture was accomplished. 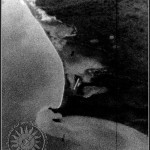 These were the first reconnaissance photos of the Soviet Union. August 18: Failed launch attempt of Thor-Able/Courier 1A from LC17A. 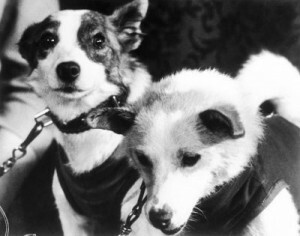 August 19: Launch of Korabl Sputnik 2 (Sputnik 5) with two Russian dogs (Belka and Strelka) and other biological samples (12 mice, 2 rats, fruit flys). They were recovered successfully after a 17-orbit flight. Strelka gave birth to six puppies, one of which was given to JFK’s children by Kruschev. 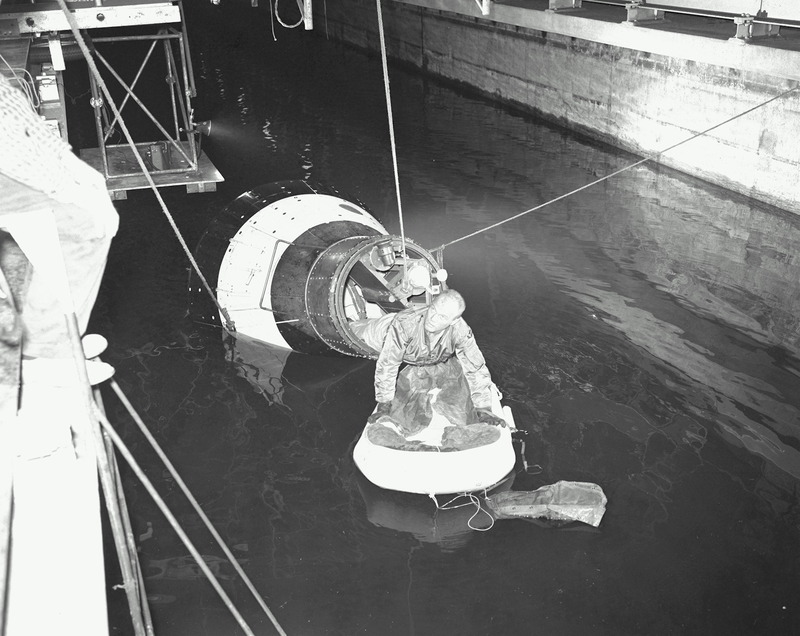 August: Group 1 astronaut training: Egress training, phase 3, underwater egress was accomplished at NASA Langley Research Center in August 1960, with the Langley Research Center Hydrodynamic Basin No.1 again being used. Each astronaut made six egresses while the spacecraft was submerged. Half of these were accomplished while wearing the Mercury pressure suit. Approximately 25 hours per astronaut. September 10: NASA selected Rocketdyne (North American Aviation) to develop the J-2 upper stage engine. September 13: Discoverer 15 launch from Vandenburg AFB on a Thor-Agena A.
September 15: Two Air Force officers emerged from a sealed cabin at Brooks Air Force Base after a 30 simulated space flight. September 15: An Atlas Able V unsuccessful launch attempt was made to place a 387 pound satellite into lunar orbit. September: The astronauts received weightless training in a modified C-135 jet aircraft. This was the third type of aircraft used by the astronauts in such training. The previously mentioned F-100 provided a weightless period of some 40 to 50 seconds; the C-131, 15 seconds; and the C-135, 30 seconds. During the C-135 flights, the astronauts were checked for changes in normal speech and their ability to control a tracking problem while undergoing moderate g-loads prior to entering the weightless periods. Aviation Medical Acceleration Laboratory. 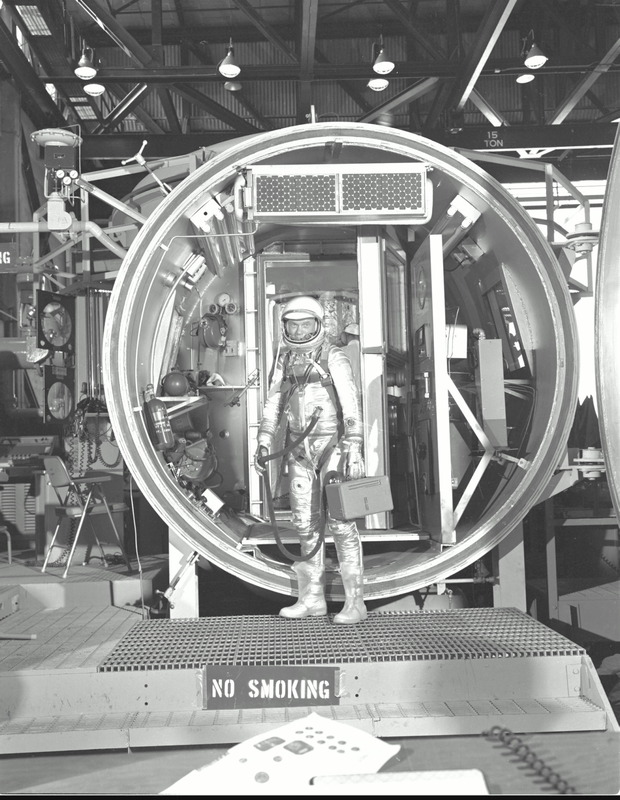 This was considered the final major centrifuge training preparation for the first manned Mercury-Redstone flight. No difficulties were encountered; a decided improvement in the performance of 3- axis hand-controller tasks by the astronauts was noted. 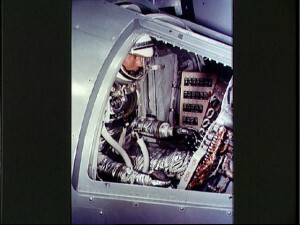 The Mercury-Redstone 3 (MR-3) flight activities were adhered to as closely as possible – actual spacecraft couches were used, a production hand-controller assembly was installed, the latest model pressure suits were worn, and the environmental control system was equipped with a freon coolant. Failures in spacecraft sequencing were introduced which required the astronaut to initiate an appropriate manual override. October 4: Successful launch of Courier 1B (communications satellite) by a Thor-Able from LC17B. October 7: The Federation Aeronautique Internationale set 100 km as the boundary for manned space flight. October 10: The USSR attempted to launch a Mars flyby probe (unsuccessful due to third stage failure). Also called Mars 1960A or 1M #1. First attempt at interplanetary mission. October 11: Failed attempted launch of Samos 1 (reconnaissance satellite) from Vandenburg AFB on an Atlas Agena A.
October 14: The USSR attempted to launch a Mars flyby probe (unsuccessful due to third stage failure). 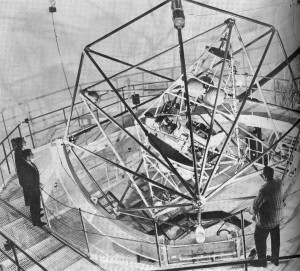 Also called Mars 1960B or 1M #2. October 24: The Soviet Union announced that Marshall Mitrofan Ivanovich Nedelin, chief of the Soviet ICBM forces, was killed in an air crash. Actually, a R-16 rocket booster exploded due to premature ignition of the second stage engines on the pad at Baikonur, killing Nedelin and 90-150 engineers/technicians (not acknowledged until 1989). Many were killed by exposure to the poisonous gas from the UDMH rocket fuel. The designer of the R-16, Mikhail Yangel, barely survived. October 26: Failed launch of Discoverer 16 from Vandenburg AFB on a Thor-Agena B.
November 3: Launch of Explorer 8 by a Juno II from LC26B. November 8: Launch of Little Joe 5 (first flight of a production Mercury space craft). The launch was normal until 15.4 seconds after lift-off, at which time the escape rocket motor was prematurely ignited. The spacecraft did not detach from the launch vehicle until impact and was destroyed. 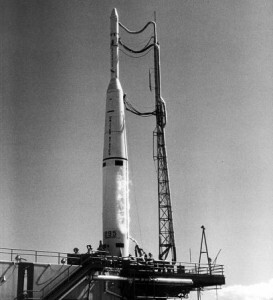 November 12: Discoverer 17 launch from Vandenburg AFB by a Thor Agena B. First use of the Agena B second stage. It was eventually flown on 76 missions. November 15: The USS George Washington departed Charleston, SC for the first submarine nuclear ballistic patrol with 16 Polaris missiles. November 21: The unsuccessful launch attempt of an unmanned Redstone-Mercury 1. After rising an inch off the pad, the rocket cut off, but the escape rocket ignited and roared away, leaving the capsule still attached to the Redstone. The complete Mercury Control Center with full staff operated for the first time. November 23: Tiros II (weather satellite) successfully launched by a Thor-Delta from LC 17A. November 30: Failed launch of Thor-Able/Transit 3A (navigational satellite). December 1: Launch of Korabl Sputnik 3 (Sputnik 6 or Vostok 1, No. 3) with two Russian dogs (Pchelka and Muska) and other biological samples. The capsule burned up on reentry. December 2: Exceedingly valuable information was returned by Discoverer XVII, it was announced (possible cover story), as a result of the recovery from orbit of human tissues which were exposed to an unexpected heavy dose of radiation for 50 hours in flight. 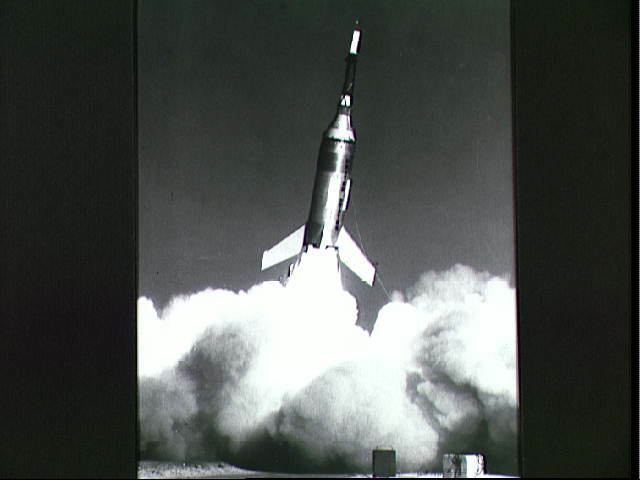 December 4: First attempt to launch a satellite from Wallops Island, VA. using a solid fuel Scout rocket resulted in a failure. December 7: Discoverer 18 launch from Vandenburg AFB by a Thor Agena B. It was reported that the payload included human tissues, algae, spores, gamma globulin, albumin, gold foil, and various films (possible cover story). December 10: It was reported that the cells carried in Discoverer XVII suffered little damage despite the heavy load of solar radiation to which they were exposed. Those lightly shielded with aluminum suffered less damage than those protected by gold or lead which emitted secondary gamma radiation (possible cover story). at the altitudes traversed by the Discoverer flights (possible cover story). December 13: Dr. James R. Killian, Jr. warned against excessive expenditures for space research including man-in-space and big boosters. He suggested the money might better be spent on education. 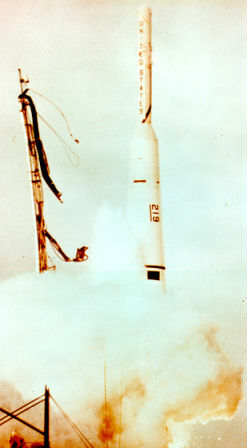 December 15: Failed Atlas Able launch with Pioneer 6B from LC12. The intended lunar orbiting rocket, exploded above Cape Canaveral, 70 seconds later, with the parts falling into the ocean 8 to 12 miles away. 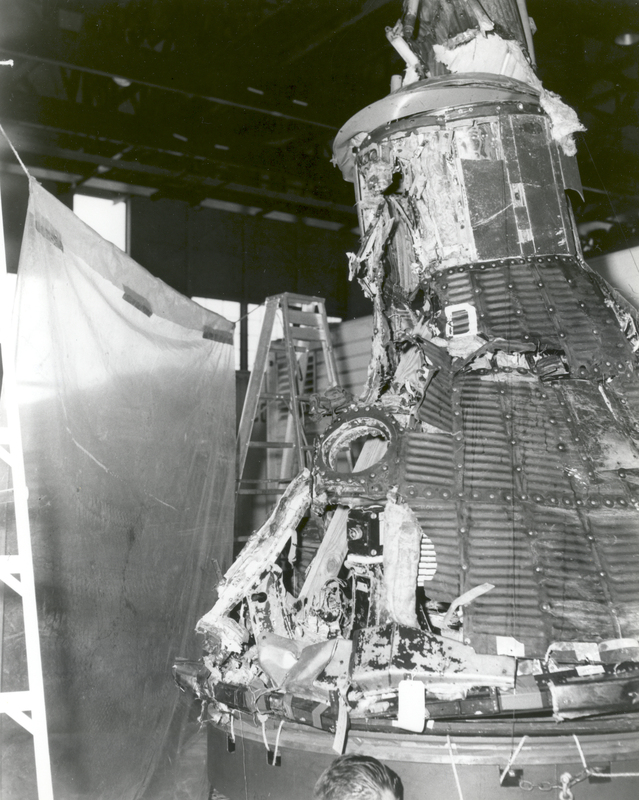 This was the fourth and final failure using the Atlas Able combination, and followed three earlier failures with the Thor Able in attempts to establish a satellite in orbit around the Moon. 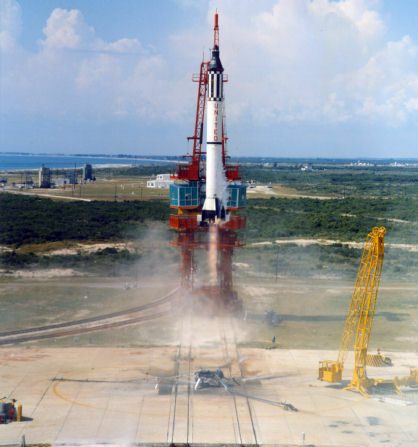 December 19: Repeat launching of MR-1 (MR-1A), the Mercury Redstone test of an unmanned Mercury capsule at Cape Canaveral. All phases of the operation were successful. 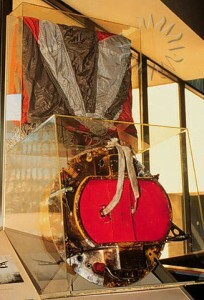 The capsule rose 135 miles and landed in the Atlantic 235 miles away. Maximum velocity was 4,910 miles per hour. December 20: Discoverer 19 launch from Vandenburg AFB by a Thor Agena B.
December 20: President-elect Kennedy announced that Vice President-elect Johnson would in the future head the revitalized National Aeronautics and Space Council. 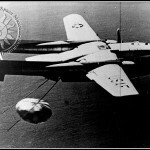 December 22: Failed Korabl Sputnik (also called Vostok 1, No. 4) launch with two Russuian dogs (Damka and Krasavka). The second stage failed to ignite rsulting in a suborbital flight. Both dogs were recovered. December: Group 1 astronaut training: Environmental Control Systems Trainer. Additional training in the operation of the environmental control system was provided by the environmental control systems trainer which was a heavy shell mock-up with a prototype spacecraft environmental system. 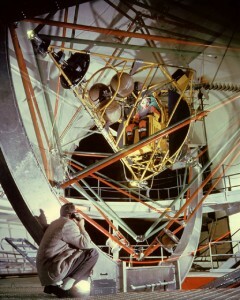 The device used was delivered to NASA in November 1960 and installed in a man-rated vacuum chamber at the U.S. Naval Air Crew Equipment Laboratory in Philadelphia. During December of 1960 and January of 1961, the astronauts participated in a program of system familiarization that included being exposed to a simulated reentry heat pulse and approximately 2 hours of the expected post-landing temperature. 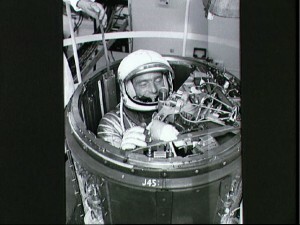 During these runs, the astronauts wore the pressure suits and became familiar with function of the suits when associated with the environmental control system. However, since a provision had been made for simulating the suit function in the procedures trainer, this type of training was not considered essential. This was particularly true since the astronauts received further first-hand familiarization to the environmental control system by participating in the preflight checkout of the spacecraft environmental control system at the launch site. Strughold, A, Ritter, O L. Eye hazards and protection in space. Jacobs, H L. Review of available information on the acoustical and vibrational aspects of manned space flight. JAM 1960 31:468-477. Schaefer, H J. Tissue ionization dosages in proton radiation fields of space. Hanna, T D, Gaito, J. Performance and habitability aspects of extended confinement in sealed cabins. JAM 1960 31:399-406. Hall, A L, Martin, R J. 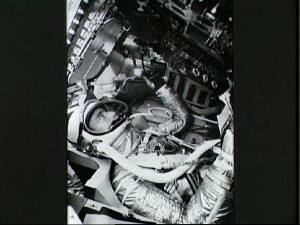 Prolonged exposure in the Navy full pressure suit at “space equivalent” altitudes. JAM 1960 31:116-122. Clark, R T, Clamann, H G, Balke, B, Tang, P C, Fulton, J D, Graybiel, A, Vogel, J. Basic research problems in space medicine. JAM 1960 31:553-577. Burch GE, Gerathewohl SJ. Observations on Heart Rate and Cardiodynamics During Weightlessness. Bovard RM. Oxygen Sources for Space Flights. Jacobson SL. Engineering of the Sealed Cabin Atmosphere Control System. Hock RJ. The Potential Application of Hibernation to Space Travel. Lamb LE. Medical Aspects of Interdynamic Adaptation in Space Flight. Zinn MB, Wilson CL. Medical Problems in Testing High Altitude Pressure Suit.